We here at Saizen (along with our best buds, Ruri) present a bit of a change of pace from our usual sports-heavy release schedule to bring you Mitsuwano (Three Rings), a one-shot slice of life story about Mai, Midori, and Riko – three girls who are training to be maiko, which are considered to be apprentice geiko (the Kyoto equivalent of geisha). We hope you enjoy this brief glimpse into a section of Japanese culture that’s otherwise glossed over in anime, with a side helping of angst as the girls find out that the world of the geiko is just as competitive as any other. And a few cultural notes to help you understand some of the finer points of the geiko world: Girls training to be maiko and geiko live in an okiya (a boarding house) run by a proprietress with the title “okaa-san” (Lit: “Mother”), which is a little confusing in this anime because the Mother of this particular boarding house is Riko’s biological grandmother. But the okiya is a tight-knit, familial environment in general, meaning that being related doesn’t elevate you above your “sisters“ and you are expected to perform the same chores, such as preparing meals, doing the laundry, and cleaning the boarding house. It’s also important to note that the anime takes place in Kyoto, which has its own dialect characterized by its politeness and modesty, to the point where it’s viewed as boorish for a native of Kyoto to use standard phrases instead of their Kyoto equivalents. This polite streak extends as far as calling the stove “Mr. Stove”, so if you’re wondering why everyone’s talking like they’re from a forgotten age, that’s why. 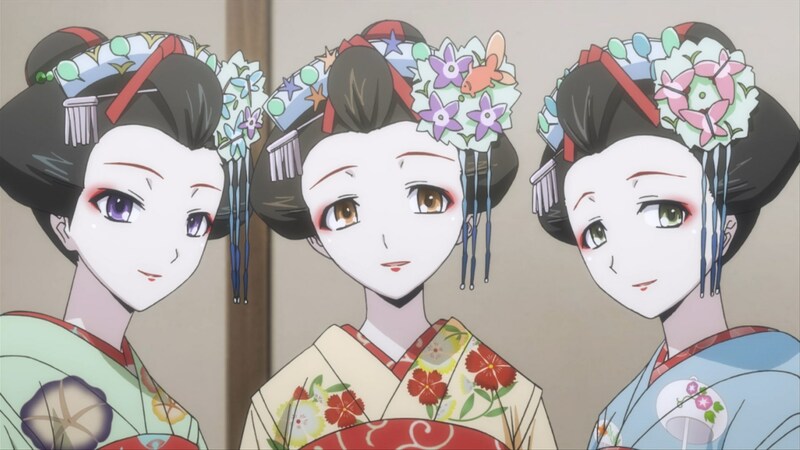 So without further ado, step into the colorful world of the geiko and the apprentices working their way up the chain to be seen as true daughters of Kyoto!